Most people know they need an emergency fund as part of their financial plan to in the event that they lose their job or face an expensive medical emergency. While there are rules of thumb for emergency funds, such as 3 to 6 months expenses, unique circumstances dictate that the size of an emergency fund be customized to one’s circumstances and preferences. 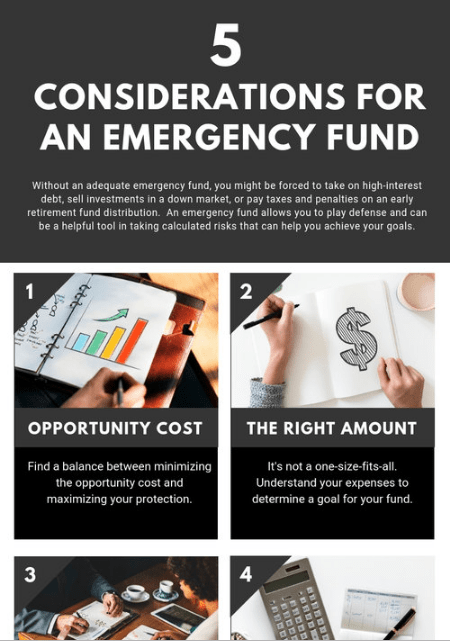 Given competing priorities in life, we recommend building your emergency fund in stages if you don’t have one already since a small emergency fund is better than none at all. While there are many options when it comes to where to put your hard-earned emergency fund cash, it’s important to have it stored in somewhere safe and easy to access. As time passes and you stay on track with your goals, you may get to the point where you won’t need an emergency fund. tips and considerations when it comes to your emergency fund by Planning to wealth.